What makes a text complex? Is it the structure? Is it sentence length? Is it student motivation? Text complexity is made up of all these characteristics and more. In Appendix A of the Common Core State Standards, the Standards’ Model of Text Complexity explains how quantitative dimensions, qualitative dimensions, and reader and task considerations are all crucial in determining if a text is appropriate for a particular audience. __ // ]]>Looking quantitatively, The Lexile® Framework for Reading provides bands that are matched to grades and supply a range within which students should be reading at each grade level. 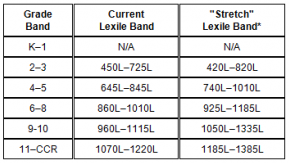 Note the “Current Lexile Band” is below the “Stretch Lexile Band” as Lexile® is responding to the Common Core State Standards Initiative to prepare all students to be college and career ready by increasing the Lexile® range per grade band. However, quantitative measure alone is not sufficient to measure text complexity. Here’s an example of why all three components are essential. Suppose you are allowing for having students to read Lord of the Flies by William Golding. Quantitatively, it’s Lexile score is 770. This would place it in the 4-5 grade band. However, qualitatively the text is complex because it has multiple levels of meaning, an implicit purpose, figurative and ironic language, and complex knowledge demands, particularly around theme. For instance, the theme of civilization verses savagery may be too complex for 4th or 5th graders. The third component that is critical when considering if the text is complex or not, is to look closely at the tasks being assigned to the reading. Sarah Brown Wessling, 2010 National Teacher of the Year, speaks to this point in the Teaching Channel webinar. I appreciate her “working definition” of text complexity and ability to demystify what text complexity requires of teachers. A body of text that quantitatively scores in the 4-5 grade band, like Lord of the Flies, should still be taught in grades above the assigned Lexile® band if the teacher is planning for complex tasks attached to the text. It is critical the teacher is intentionally planning for learning opportunities that allow students to put into practice complex thinking and conceptual skills with accessible texts. To build on complexity, the teacher may then choose to thematically bundle texts and have students exploring relationships between texts. For instance, after reading Lord of the Flies, students may compare the novel to Nigel Williams’s stage adaption of the novel. The Common Core states that “Students must grapple with works of exceptional craft and thought” (College and Career Readiness Anchor Standards for Reading, p. 35). By paying attention to quantitative dimensions, qualitative dimensions, and reader and task, students will have opportunity to grapple, with appropriate scaffolding, with complex texts. This entry was posted in Blog and tagged Lexile, text complexity. Bookmark the permalink.